We, the Watchu team, look forward to assisting you, your family, and your adult advisors as you and your crew prepare for your never-to-be-forgotten Philmont adventure. Philmont is a major challenge - it is NOT “just a hike!” Keep this guide handy - it provides the information you need to successfully prepare for Philmont. You should have already completed an application and submitted it along with your deposit (a portion of which is non-refundable). If needed, applications can be downloaded from the Quick Links page of the Watchu Experience Web site, www.watchu.org. Failure to submit applications and deposits in a timely manner may result in your crew’s place in a Patriots’ Path contingent being revoked and given to another crew on the Waiting List. Confirmation of receipt of your registration and deposit will be mailed to you in May. Making subsequent payments per the schedule, using the coupons enclosed with this guide, is required for you to remain a member of the crew. The first seven months of your Watchu Experience is the time to take care of financial matters, required training, and team building. Crew and Family Gatherings - Your adult advisors should meet periodically with the crew to plan fund-raising and team-building activities, and to discuss participation requirements and training. Families should be included at these gatherings, when appropriate. The Watchu Experience Web site (www.watchu.org) - The Web site has all the information about Patriots’ Path Philmont expeditions. The Watchu Web Site section of this Guide provide an overview of what is available on the Web site. Check the site on a regular basis - there you will likely find the answer to any question you may have. In particular, the FAQs page has the answers to years of questions about Philmont and the Watchu Experience. Payments / Philmont Scout Account - Each crew member has an individual Scout Account for Philmont with Patriots’ Path Council. Payment Coupons are included in this booklet and are also available on the Watchu Experience Web site (www.watchu.org). Family and other benefactors can contribute toward your adventure using the Gift Coupons enclosed. You can also use these coupons for your own deposits from fundraising activities or summer employment. Two of the four payments are due during this first phase of Watchu, which is the time to be concentrating on fundraising. Working at Summer Camp as a Watchu Camp Staff Fellow is a great way to both earn money and have fun. The only requirement is an understanding that a portion of your salary will be applied toward the cost of your Watchu Experience. Download an application from the Watchu Experience Web site. Participating as a crew or an individual in Patriots’ Path’s Fall Popcorn Sale is another great way to earn a significant portion of your Watchu Experience fee. Full Crew of 12 - Patriots’ Path requires a full crew of 12. If your crew does not have 12 members, recruit in your unit or neighboring units for additional members to fill your crew - in fact, all crews should over-recruit to develop a waiting list of potential replacements. Be prepared - a sad fact is that every year several crew members must drop out of the contingents for a variety of reasons. Having people on a waiting list ready to replace someone unable to continue with your crew means your crew will minimize the disruption that occurs when a crew member is lost. BSA Registration - Each member of the crew must be a registered member of the Boy Scouts of America. There is no rank requirement for youth. Parents in the crew who are not already registered BSA members must complete and submit an application. All adults are required to complete the online Youth Protection training program. CPR and Wilderness First Aid - At Philmont, each crew must have at least two members with current CPR and Wilderness First Aid training. The Watchu team recommends that three members complete the training. A pre-requisite for the WFA course is current CPR certification. Taking a CPR course after July means you will be ready both for the WFA courses offered in the fall and for Philmont next summer. Physically Fit - Philmont is physically demanding - any crew member who does not meet Philmont’s weight for height or blood pressure requirements for participation must start now to qualify. Anyone failing to do so will not be allowed into the Philmont backcountry and will be sent home. But simply meeting the weight for height and blood pressure requirements is not enough - every crew member must embark on an individual physical fitness program to meet the backcountry challenges of a Philmont trek. You and your doctor should review the participation advisories on the BSA Annual Health and Medical Record. Admission to the backcountry is dependent on a fully completed and signed medical form, and no other form can be substituted for the Philmont Medical Record. That form will give your crew advisors the medical information required for crew training events. Be assured your medical needs will be superbly administered during your stay at Philmont, as the Philmont Medical Department is a teaching hospital for the University of Kansas Medical School. Watchu Advisor COPE - one day only, Saturday April 29, 2016. Learn team-building concepts on Mount Allamuchy’s low COPE (Challenging Outdoor Personal Experience) course Saturday afternoon during the Watchu Mountain Adventure for 2014 crews. Stay for dinner with the Watchu Staff to gain insights about Philmont and the Watchu Experience. Watchu COPE - a full day low course COPE program at Mount Allamuchy, specifically designed to help your Philmont crew become a well-functioning team. A series of challenging scenarios require the crew to work together to achieve a common goal and provide opportunities for crew members to demonstrate their leadership abilities. Watchu Canoe Trek - Patriots’ Path’s Sabattis Adventure Camp has developed a week-long canoe trek specifically for Watchu crews, including special per person pricing and discounts for adult advisors. Check out the brochures, the Watchu-specific inserts, and the Watchu Experience Web site for details about these programs and prices to participate. The second phase of the Watchu Experience, the following eight months, is the time to assemble the gear necessary for your adventure, to learn Philmont-specific methods of hiking and camping, and continue building your crew into a team. It is also the time for the crew’s adult advisors to complete the administrative items necessary for your Philmont trek. Lead Advisor Conference - at the Lead Advisor Conference in September (date to be announced and posted on the Watchu Web site) all Patriots’ Path and Philmont requirements for trek participation, listed on the Watchu Passport, will be reviewed with your crew’s Lead Advisor. The Watchu Experience Advisor Guide - the Advisor Guide, distributed at September's Lead Advisor Conference, outlines the responsibilities and obligations of the adult advisors related to training the crew for a successful Philmont trek. Advisor Briefings - the adult advisors from your crew will participate in a series of four Advisor Briefings held in November, January, March, and June (dates to be announced). These briefings concentrate on the information that the advisors need to train and prepare their crew. The Watchu Network - Chief Watchu communicates with the advisors of our expedition crews by e-mail. Watchu Grams, issued on a regular schedule, provide timely information crew members need for a successful trek. Each crew should create a family e‑mail network for forwarding Watchu Grams to all crew members and families, as well as for crew-specific messages about meetings, shakedowns, family gatherings, etc. Watchu Reminders and Alerts, issued less frequently and on an as-needed basis, include reminders about coming events as well as changes to information provided previously. There will also be occasional messages of a general nature. Equipment - The necessary gear is described on Philmont equipment lists for both individual crew members and the crew as a group. The Watchu staff will provide recommendations and insights so that you have exactly what you need for your adventure. Crew members should first concentrate on the Four Expensive Essentials of boots, sleeping bag and mat, full rain suit with both jacket and pants, and a backpack. Monthly Gatherings - Your crew will meet approximately once a month for training, fun, and fellowship. Shakedown hikes will allow the crew to learn about equipment and Philmont camping procedures. Your crew will also meet to discuss the activities they wish to participate in during their Philmont trek, and select the five Philmont trek itineraries that most interest them and meet their abilities. A few of the gatherings will include your entire family. These gatherings are the essence of your Watchu Experience. They will be focused on fun, anticipation, and the excitement leading up to your great adventure in the high mountains of New Mexico. Team-Building Patriot's Path's Operation Zero at Sabattis Adventure Camp in January is a great opportunity for your crew to work together and have an outstanding adventure at the same time. Do you have questions? The answers to years of advisor and parent questions have been collected in the Frequently Asked Questions on the Watchu Experience Web site, www.watchu.org. All crews and all crew members are expected to attend the Watchu Mountain Adventure, Friday April 28 to Sunday, May 1, 2016. This weekend will complete your crew's training and let you put it to the test. The staff of veteran Philmont Scouters will be available to answer all your questions. Please note carefully – this will be a SAT weekend. If you plan to take the SAT exams in 2016, schedule them for another time. You can reschedule now, but probably not later. All crews gather on Watchu Mountain for a simulated Philmont experience, including camping, cooking, backpacking, and backcountry living. One of the highlights is a “rugged” 8-mile hike designed to test each crew’s hiking readiness. Others are two evening multi-media shows and an individual trail planning session for each crew with an experienced Philmont trekker to help get the most out of your Philmont trek. Often the Watchu Mountain Adventure is referred to as “a mid-term exam” because it serves to define the “gaps” between “where the crew is in it’s preparation ” and “where it needs to be” to be ready. It is a weekend of self-evaluation. Each crew returns home with a concrete list of gaps which must be closed during the remaining weeks before leaving for New Mexico. These gaps define the final weeks of crew development and training. According to Chief Watchu, closing the gaps will assure a wonderful Philmont experience. You will fly to Colorado and spend two fun-filled and excitement-packed days and nights in the Front Range of the Rockies. Activities will include a visit to the Air Force Academy, riding the cog railway to the top of Pikes Peak, and whitewater rafting on the Arkansas River. You will spend the nights at the University of Colorado in Colorado Springs, with access to its pool and recreation facilities. Time to put all your training and preparation to use! You will spend 12 days at Philmont Scout Ranch, the Boy Scouts of America’s premier high adventure base. After a day of various check-in tasks, your crew will board a bus for a trailhead and eleven days / ten nights in the Philmont backcountry. In addition to spectacular scenery, your crew will work as a team to meet the challenge of summiting high peaks and will participate at staffed camps in western-themed programs such as rock climbing, black powder rifle, and horseback riding. Indeed, Philmont is much more than “just a hike”! 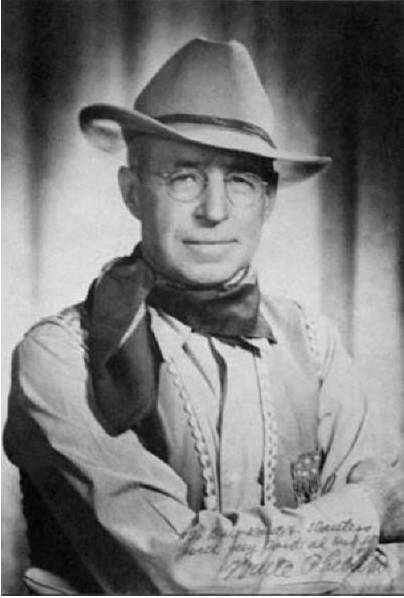 Waite Phillips donated most of the land that is now Philmont Scout Ranch to the Boy Scouts of America.